Conestoga’s new Applied Research facility at 96 Grand Avenue South in Cambridge will be open to the public on Saturday, September 15 for Doors Open Waterloo Region. Learn more about e-waste recycling research at Conestoga at Doors Open on September 15. 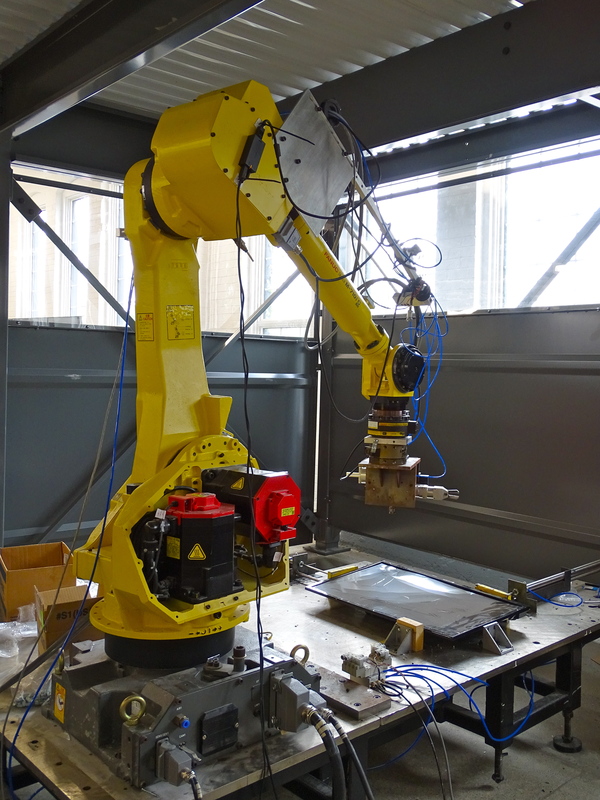 This robotic system at Conestoga's Applied Research facility uses non-destructive methods to dismantle hard drives for material recovery. Built in the late 1800s to house a machinery factory, and more recently home to the Tiger Brand Knitting Company, the site is now part of a large-scale redevelopment project in Galt that began in 2016 to establish the Gaslight District, a new urban community that will also include retail and residential space. The Applied Research facility occupies the lower floor of the Grand Avenue South property and provides space for Conestoga’s Applied Research and Innovation office, Centre for Smart Manufacturing, Waste Electrical and Electronic Equipment (WEEE) lab, Cybersecurity Zone and Centre for Entrepreneurship. The centres, previously spread across Conestoga’s Doon and Cambridge campuses, have now been grouped in one innovation hub that doubles the lab space available to researchers. Conestoga is currently ranked among Canada’s top 25 research colleges, and is in the top 10 for research revenue growth. During Doors Open, visitors will have a chance to meet with Conestoga’s faculty members, students and industry partners who will demonstrate some of the solutions they have in development to meet the real-world challenges of local businesses trying to improve productivity and competitiveness. Among the current projects led by Dr. Hamid Karbasi, Conestoga’s NSERC Industrial Research Chair for Colleges in Advanced Recycling Technologies for WEEE, is one that explores the use of high speed robots to disassemble and recover high value components from computer hard drives, and a system to effectively sort black plastics by their polymer. Both projects were launched in partnership with Greentec, a Cambridge-based electronics recycler, to address challenges around e-waste recycling. Applied research at the Centre for Smart Manufacturing, led by Ig Kolenko, focuses on high performance manufacturing and information and communication technology-enabled manufacturing. Current projects include the prototype of an electric utility vehicle designed for industry partner Electric Tractor Inc. The vehicle is expected to be manufactured in Ontario and will be suited to residential, commercial and warehouse environments and applications. Doors Open events let community members explore noteworthy buildings, interesting places and heritage sites that are not usually open to the public. Free guided tours of the Applied Research facility will start every 15 minutes between 10:00 a.m. and 5:00 p.m. on Saturday, September 15. Visit Conestoga’s website for more information about Applied Research.